When it comes shared facilities with neighbours, there are usually two key issues: who will foot the bill for repairs which affect more than one property; and who is responsible for the general maintenance and upkeep of shared amenities, such as apartment blocks or flats. In most cases where a repair job is needed that affects your own and a neighbour’s property - a shared fence having blown down, for example - the cost of the repair will usually be a simple matter of both parties paying half each. However, if there is a Dispute Over Boundary Lines, it’ll usually boil down to looking at house deeds and other legal documents pertaining to your property to try to establish whose responsibility it is to pay for any repairs. That said, it’s often not as clear cut as you might wish, so it’s always better to try to share the costs equally or at least to make some kind of compromise about sharing a proportion of the costs, as opposed to Taking Legal Action which can often prove more expensive. Problems with drains and gutters on a roof can even throw up more problems in that, quite often, it can involve several parties, especially if you live in terraced housing or within a block of flats. In this situation, if you are able to identify that the source of the problem is due to someone’s negligence, you are quite within your rights as an individual, or collectively where it’s appropriate, to make this person foot the bill entirely themselves. 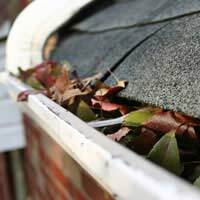 Examples might be where someone has blocked the main drain by putting items down their own drain, or problems where gutters have been affected on more than one property because of one person’s failure to keep their own gutters clean. Of course, they might deny being solely responsible or even accept they’re to blame at all. In that event, you may need to seek the advice of experts within the appropriate field to inspect the damage and to see if they are able to identify the cause of the problem which has ensued. If they’re not able to do that, you’d obviously have difficulty in proving any case in court, so you might have to end up sharing the cost of repairs anyway. If you live in student accommodation or an apartment block, you will probably have to bear some responsibility to the maintenance and general upkeep of any shared facilities. This might include cleaning a shared kitchen or bathroom/shower room facility after you have used it. People living in apartment blocks may have a small garden area to maintain and it might be that you either take turns in making sure the garden is looking tidy and mowed in the summer. Alternatively, you might decide to club together and employ a gardener or odd job man to do this. Or, in some cases, one of you might decide to take full responsibility for the upkeep of shared facilities and be paid by the rest of the residents who will benefit from your efforts. Even if you own your own property, if it’s semi-detached, you’ll also bear some responsibilities in sharing the maintenance of things like a dividing fence or mowing a lawn where the garden is not divided by a fence. It’s also important to remember that if you are living in rented accommodation, the onus for certain repairs and maintenance is very likely to be the responsibility of your landlord, local authority/council or housing association. In this situation, it’s important to check your tenancy agreement to see who is responsible for what before shelling out on any repairs or maintenance, as it might not be your responsibility. Live in a shared property? Read our advice on coping in a shared house. My terraced cottage has a shared door attached to the property as access to a house behind and our garden. The neighbours behind have painted the door a different colour to our cottage which looks odd. Our deeds say the acces is a joint facility....who therefore chooses the colour? We have a problem with our guttering and downpipe. 3 properties rely on our downpipe and builders that we've got to look at the problem say this is no longer sufficient - with heavy rain patterns - and that at least one of our neighbours should get one installed. Additionally, the guttering is all connected, so they have advised that if we get our gutting replaced and a new downpipe (with wider head probably) this will mean that our two adjoining neighbours will also need new guttering in order to attach to our downpipe. The existing guttering is an older less efficient style, that we'd like to replace after numerous problems. Advice please! I also have a problem related to the open plan design front of house on a new build. As I look out of my front door, at each side of the drive are strips of land, and whilst I have maintained the left side, the adjoining neighbours to my right have failed to maintain and of the right side, it looks awful and completely ruins the outlook with grass and weeds over a foot high, their rear garden is equally as bad but not visible due to 5ft fencing. Do I report them to housing again or maintain it myself as I’m apparently responsible for half of it? I live in freehold flat with four other neighbors. There is common secluded forecourt.The neighbour on the first floor has installed CCTV. There has never been incidents of crime. I feel that I have been spied on. Does he have a right to do so? Check with the building management company if you have one...they should be the ones erecting any CCTV in communal areas and should inform all other residents that it's there. If they can't do anything talk to the neighbour and say you would rather they didn't place CCTV in the communal areas. If the neighbour doesn't agree, refer to them to the right of an individual to have their private life and information protected detailed in the Human Rights Act. I live in freehold flat with four other neighbors. There is common secluded forecourt. The neighbour on the first floor has installed CCTV. There has never been incidents of crime. I feel that I have been spied on. Does he have a right to do so? We residents have converted a 25 meter long dirty garbage black-spot in Bangalore into a flower garden. This drastically reduced the garbage dumping to just 5-10%. . But the remaining garbage dumping is going to attract a tendency to dump more in future. We residents are planning to put a cctv camera as we cannot guard the area fulltime. . Please inform if there is any legal issues in covering this public area with CCTV. We got permission from an adjacent building owner to install the camera on his 2nd floor wall. Please advice. My neighbour spread ridiculous untrue gossip about me when I starteda new job. I think this was done on facebook. However, my present problem is that I think she is sometimeswatching me via some type of 'indetectable' surveillance that her ex RAF son in law set up. I started to think this when I walked out and noticed 2 new holes in wooden fence and a voice saying "there she is, she's got no shoes on" and later when I was indoors a comment on what I was doing! My garden is small and leafy and has a 5-6ft fence around it. my neighbours above me has put 3 cctv cameras up they are over a comuneral area I and my friends are being watched everytime I go out or my friends come to see me , being disabled I need people to come and help me with things . can I ask the police to look at where they are positionedwe live in a ground floor flat , even my grand children come hear , im also 65 yrs old and don't want people spying on me, what could be my next move. My neighbour has a CCTVcamera in our shared driveway which is impinging on our privacy, as well as a spot light facing our property, and very disturbing as the light comes into our bedroom and kitchen,there is no sign up that he has CCTV. Is this legal. Hi, my wife and l live on an unadopted road which is a Cul-de-sac and private, although the public can drive on the road. Each owner owns their own pavement and road within the boundaries of their property. We are responsible for the maintaining our own bit of pavement and road. The neighbor across the road has CCTV in their lounge and in the top corner of the front bedroom, both CCTV face our front and bedroom windows. I live in Devon and the village does not suffer any crime and is extremely quiet. My wife and I as well as visitors and friends to our home, when I have asked them, notice the CCTV in the neighbors bedroom window, tracks us on our property. I believe it is a self tracking system. My friends and visits have walked up and down our pavement, and again watches them. Is this targeted and tracking CCTV legal. There are no signs telling the public that CCTV is watching them. Please help. You should ask your local police to pop round and take a look. If the cameras are trained on an area used by the public, then it should probably be re-sighted. Hi, my wife and l live on an unadopted road which is a Cul-de-sac and private, although the public can drive on the road.Each owner owns their own pavement and road within the boundaries of their property.We are responsible for the maintaining our own bit of pavement and road.The neighbor across the road has CCTV in their lounge and in the top corner of the front bedroom, both CCTV face our front and bedroomwindows.I live in Devon and the village does not suffer any crime and is extremely quiet.My wife and I as well as visitors and friends to our home, when I have asked them, notice the CCTV in the neighbors bedroom window, tracks us on our property.I believe it is a self tracking system.My friends and visits have walked up and down our pavement, and again watches them.Is this targeted and tracking CCTV legal.There are no signs telling the public that CCTV is watching them.Please help. Our neighbour has a right of access through the front of our property. I want to make improvements like putting slabs down for example. Is the neighbour obliged to pay some of my expenses? @doreen. Do you have a landlord or management company? If so, they should be your first option. If not, then a solicitor's letter may help regarding the access. The Environmental Health Office or RSPCA could help with the cats. my neighbour and I share an entry between our houses.He collects things to sell at car boots etc.bikes.micro wavesany old thing really.He has now made it impossible to use the entry and I cant get my wheely bins in /out ..If there was a fire I doubt the fire brigade would get access.I,ve asked him several times to clear it ,but he tells me he will,but never does ..his own back garden is full and out side his kitchen the same .There are feral kittens in the entryfrom one of his females...and I,m plagued with fighting tom cats to,after his females who are constantly having kittens .Where do istand in getting him to clear this mess . @saphhire.You can ask the police to take a look at where the cameras are pointing. They will assess to see if they feel it's necessary and/or impinging your privacy. Our neighbours have mounted a CCTV camera directed at our land which is also used by our grandchildren. What can we legally do please? @elles. In general notices should be posted where CCTV cameras are in operation. If you are on private property and the cameras are pointed only at your own property, then no signs are needed. @micko. Alternatively you may not want your every move to be watched all the time by your neighbour? The neighbour has a right to install a camera to guard and protect his property. Complaints are usually by other neighbours having a fall out or throwing rubbish into peoples gardens.The neighbour complaining is probably upset that he or she is being filmed for benefit fraud or can't throw bits of rubbish in their garden or yard in case they get caught, that's why most people complain about cctv. I believe that the cctv cameras that my neighbour has are impinging on our privacy as they are not only being directed at our property but in a place where children play. what can be done? I suspect the installation of 2x CCTV cameras by my neighbour are impinging on our privacy as the are directed at my property. What is my next course of action?